Vanilla is the common name and genus name for a group of vine-like, evergreen, tropical, and sub-tropical plants in the orchid family (orchidaceae), including the commercially important species Vanilla planifolia, from whose seedpods a popular flavoring extract is derived. The term also is used for the long, narrow seedpods of V. planifolia (also called vanilla bean) and for the flavoring agent either derived from the cured seedpods or synthetically produced. Vanilla, whose use traces to Pre-Columbian in Central America, is valued for its sweet flavor and scent and is widely used today in the preparation of desserts and perfumes. The primary compound responsible for its characteristic flavor and aroma is vanillin, although other compounds aid the flavor. The main source of natural vanilla, Vanilla planifolia, reflects remarkably on the harmony of creation, for its flower is open only one day a year, and there is only one natural pollinator, a particular species of Melipone bee. Today, humans produce large quantities of pure vanilla through a very time consuming and labor intensive process, involving hand pollination and months spent maturing and curing the seedpods. In addition, food scientists have developed an imitation vanilla, although it is considered less preferable in terms of flavor intensity and quality. The name came from the Spanish word vainilla, meaning "little pod" (Ackerman 2003). Vanilla is a genus of about 110 species in the orchid family (Orchidaceae). Orchidaceae is the largest and most diverse of the flowering plant families, with over eight hundred described genera and 25,000 species. There are also over 100,000 hybrids and cultivars produced by horticulturalists, created since the introduction of tropical species to Europe. The evergreen genus Vanilla occurs worldwide in tropical and subtropical regions, from tropical America to tropical Asia, New Guinea, and West Africa. It was known to the Aztecs for its flavoring qualities. 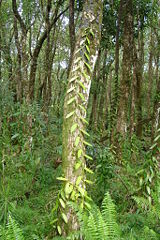 It is also grown commercially (especially Vanilla planifolia, Vanilla pompona, and Vanilla tahitensis). This genus of vine-like plants has a monopodial climbing habit. They can form long vines with a length of more than 35 meters, with alternate leaves spread along its length. 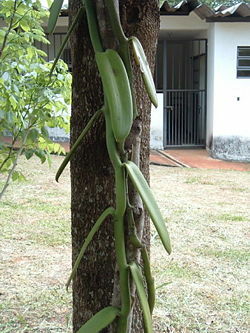 The short, oblong, dark green leaves of the Vanilla are thick and leathery, even fleshy in some species, though there are a significant number of species that have their leaves reduced to scales or have become nearly or totally leafless and appear to use their green climbing stems for photosynthesis. Long and strong aerial roots grow from each node. The racemose inflorescences, short-lived flowers, arise successively on short [[peduncles] from the leaf axils, or scales. There may be up to 100 flowers on a single raceme, but usually no more than 20. The flowers are quite large and attractive with white, green, greenish yellow, or cream colors. Their sepals and petals are similar. Each flower opens up once in the morning and closes late in the afternoon, never to re-open. If pollination has not occurred meanwhile, it will be shed. The lip is tubular-shaped and surrounds the long, bristly column, opening up, as the bell of a trumpet, at its apex. The anther is at the top of the column and hangs over the stigma, separated by the rostellum. Blooming occurs only when the flowers are fully grown. Most species have a sweet scent. The flowers are self-fertile but need pollinators to perform this task. The flowers are presumed to be pollinated by stingless bees and certain hummingbirds, which visit the flowers primarily for their nectar. But hand pollination is the best method in commercially grown Vanilla. The fruit ("vanilla bean") is an elongate, fleshy seed pod 10-25 centimeters long. It ripens gradually (8 to 9 months after flowering), eventually turning black in color and giving off a strong aroma. Each pod contains thousands of minute seeds, but it is the pod that is used to create vanilla flavoring. 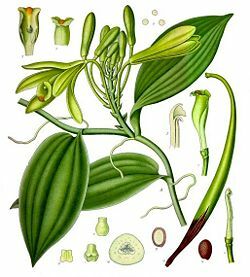 Significantly, Vanilla planifolia is the only orchid used for industrial purposes (in the food industry and in the cosmetic industry). Worldwide distribution of Vanilla species. 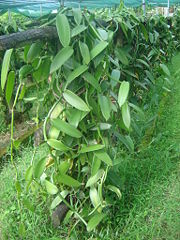 Vanilla planifolia (synonym, Vanilla fragrans) is one of the primary sources for vanilla flavoring, due to its high vanillin content. 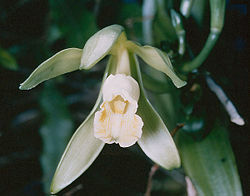 Vanilla planifolia is native to Central America and the West Indies. It prefers hot, wet, tropical climates. It is harvested mostly in Mexico and Madagascar. Of the over 25,000 species of orchids, V. planifolia is the only one that is known to bear anything edible, the vanilla "bean" (Herbst 2001). Like all members of the Vanilla genus, Vanilla planifolia is a vine. It uses its fleshy roots to support itself as it grows. Flowers are greenish-yellow, with a diameter of 5 centimeters (2 in). They last only a day. Vanilla planifolia flowers are hermaphroditic, carrying both male (anther) and female (stigma) organs. Pollination simply requires a transfer of the pollen from the anther to the stigma. However, self-pollination is avoided by a membrane separating these organs. As Charles François Antoine Morren, a Belgian botanist found, the flowers can only be naturally pollinated by a specific Melipone bee found in Mexico. If pollination does not occur, the flower is dropped the next day. In the wild, there is less than 1 percent chance that the flowers will be pollinated, so in order to produce a steady flow of fruit, vanilla growers hire laborers to hand pollinate the flowers. Fruit is produced only on mature plants, which are generally over 3 meters (10 feet) long. The fruits are 15-23 centimeters (6-9 inches) long pods (often incorrectly called beans). They mature after about five months, at which point they are harvested and cured. Curing ferments and dries the pods while minimizing the loss of essential oils. Vanilla extract is obtained from this portion of the plant. The compound vanillin (4-hydroxy-3-methoxybenzaldehyde) is the primary agent responsible for the characteristic flavor and smell of vanilla. Many other compounds present in the vanilla extracts flesh out the full vanilla flavor as also does another minor component of vanilla the essential oil, piperonal (heliotropin). Piperonal and other substances affect the odor of natural vanilla. Vanilla essence comes in two forms. Real seedpod extract is an extremely complicated mixture of several hundred different compounds. Synthetic vanilla essence, consisting basically of a solution of synthetic vanillin in ethanol, is derived from phenol and is of high purity (Havkin-Frenkel 2004). The synthetic vanillin, ethyl vanillin, which does not occur in the vanilla bean, as patented by German chemist Ferdinand Tiemann in 1875, and has over three times the flavor and more storage stability, although it lacks the true flavor (Bender and Bender 2005). The first to cultivate vanilla were the Totonac people. The Totonac people resided in the eastern coastal and mountainous regions of Mexico at the time of the Spanish arrival in 1519, and were the first people encountered by Hernan Cortes at Vera Cruz. (Today they reside in the states of Veracruz, Puebla, and Hidalgo.) They built the Pre-Columbian city of El Tajín, and further maintained quarters in Teotihuacán (a city which they claim to have built). Until the mid-nineteenth century, they were the world's main producers of vanilla. According to Totonac mythology, the tropical orchid was born when Princess Xanat, forbidden by her father from marrying a mortal, fled to the forest with her lover. The lovers were captured and beheaded. Where their blood touched the ground, the vine of the tropical orchid grew (Hazen 1995). In the fifteenth century, Aztecs from the central highlands of Mexico conquered the Totonacs, and the conquerors soon developed a taste for the vanilla bean. They named the bean tlilxochitl, or "black flower," after the mature bean, which shrivels and turns black shortly after it is picked. After they were subjected to the Aztecs, the Totonacs paid their tribute by sending vanilla beans to the Aztec capital, Tenochtitlan. Vanilla was completely unknown in the Old World before Columbus. Spanish explorers who arrived on the Gulf Coast of Mexico in the early sixteenth century gave vanilla its name. The Spanish and Portuguese sailors and explorers brought vanilla into Africa and Asia in the sixteenth century. They called it vainilla, or "little pod." The word vanilla entered the English language in the 1754, when the botanist Philip Miller wrote about the genus in his Gardener’s Dictionary (Correll 1953). Until the mid-nineteenth century, Mexico was the chief producer of vanilla. In 1819, however, French entrepreneurs shipped vanilla beans to the Réunion and Mauritius islands with the hope of producing vanilla there. After Edmond Albius, a 12-year-old slave from Réunion Island, discovered how to pollinate the flowers quickly by hand, the pods began to thrive. Soon, the tropical orchids were sent from Réunion Island to the Comoros Islands and Madagascar along with instructions for pollinating them. By 1898, Madagascar, Réunion, and the Comoros Islands produced 200 metric tons of vanilla beans, about 80 percent of world production (Rasoanaivo et al. 1998). The market price of vanilla rose dramatically in the late 1970s, due to a typhoon. Prices stayed stable at this level through the early 1980s, despite the pressure of recently introduced Indonesian vanilla. In the mid-1980s, the cartel that had controlled vanilla prices and distribution since its creation in 1930, disbanded. Prices dropped 70 percent over the next few years, to nearly US$20 per kilo. This changed, due to typhoon Huddah, which struck early in the year 2000. The typhoon, political instability, and poor weather in the third year drove vanilla prices to an astonishing US$500 per kilo in 2004, bringing new countries into the vanilla industry. A good crop, coupled with decreased demand caused by the production of imitation vanilla, pushed the market price down to the $40 per kilo range in the middle of 2005. Madagascar (mostly the fertile region of Sava) accounts for half of the global production of vanilla, followed by Indonesia, and People's Republic of China. An estimated 95 percent of “vanilla” products actually contain artificial vanillin, produced from lignin (RVCA). 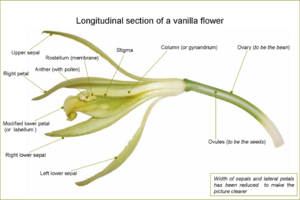 The main species harvested for vanillin is Vanilla planifolia. Although it is native to Mexico, it is now widely grown throughout the tropics. Additional sources include Vanilla pompona and Vanilla tahitiensis (grown in Tahiti), although the vanillin content of these species is much less than Vanilla planifolia. Vanilla grows as a vine, climbing up an existing tree, pole, or other support. It can be grown in a wood (on trees), in a plantation (on trees or poles), or in a "shader," in increasing orders of productivity. Left alone, it will grow as high as possible on the support, with few flowers. Every year, growers fold the higher parts of the plant downwards so that the plant stays at heights accessible by a standing human. This also greatly stimulates flowering. The flower is open and ready for pollination only one day a year, and perhaps for only a few hours, which contributes to making the process for obtaining pure vanilla very time consuming and labor intensive. The full process involves hand pollination, about six weeks for the pods to reach full size, eight to nine months after that to mature, hand picking of the mature pods, and a three to six month process for curing (Herbst 2001). The curing process involves a boiling-water bath, sun heating, wrapping and allowing the beans to sweat, and so forth. Over months of drying in the sun during the day and sweating at night, they shrink by 400 percent and turn a characteristic dark brown. The beans, which had no free vanillin when harvested, through this process of fermentation and heating develop available vanillin (Herbst 2001). The following is more detail on this process. The distinctively flavored compounds are found in the fruit, which results from the pollination of the flower. One flower produces one fruit. There is only one natural pollinator, the Melipona bee, which is found in Mexico (Herbst 2001). Growers have tried to bring this bee into other growing locales, to no avail. The only way to produce fruits is, thus, artificial pollination. Hand pollinators can pollinate about 1,000 flowers per day. The simple and efficient artificial pollination method introduced in 1841, by the 12-year-old slave named Edmond Albius on Réunion, is still used today. Using a beveled sliver of bamboo, an agricultural worker folds back the membrane separating the anther and the stigma, then presses the anther on the stigma. The flower is then self-pollinated, and will produce a fruit. The vanilla flower lasts about one day, sometimes less; thus, growers have to inspect their plantations every day for open flowers, a labor-intensive task. The fruit (a seed capsule), if left on the plant, will ripen and open at the end; it will then release the distinctive vanilla smell. The fruit contains tiny, flavorless seeds. In dishes prepared with whole natural vanilla, these seeds are recognizable as black specks. Like other orchids' seeds, vanilla seed will not germinate without the presence of certain mycorrhizal fungi. Instead, growers reproduce the plant by cutting: They remove sections of the vine with six or more leaf nodes, a root opposite each leaf. The two lower leaves are removed, and this area is buried in loose soil at the base of a support. The remaining upper roots will cling to the support and often grow down into the soil. Growth is rapid under good conditions. Harvest The pods are harvested while green and immature. At this stage, they are odorless. 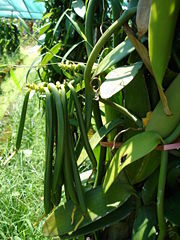 Killing The vegetative tissue of the vanilla pod is killed to prevent further growing. The method of killing varies, but may be accomplished by exposure to sunlight, oven heating, hot water, scratching, or freezing. Sweating The pods are held for 7 to 10 days under hot (45º-65°C or 115º-150°F) and humid conditions; pods are often placed into fabric covered boxes immediately after boiling. This allows enzymes to process the compounds in the pods into vanillin and other compounds important to the final vanilla flavor. Drying To prevent rotting and to lock the aroma in the pods, the pods are dried. Often, pods are laid out in the sun during the mornings and returned to their boxes in the afternoons. When 25-30 percent of the pods' weight is moisture (as opposed to the 60-70 percent they began drying with) they have completed the curing process and will exhibit their fullest aromatic qualities. Grading Once fully cured, the vanilla is sorted by quality and graded. Powder (ground pods, kept pure or blended with sugar, starch or other ingredients) The U.S. Food and Drug Administration requires at least 12.5 percent of pure vanilla (ground pods or oleoresin) in the mixture (FDA 1993). Extract (in alcoholic solution). The U.S. Food and Drug Administration requires at least 35 percent vol. of alcohol and 13.35 ounces of pod per gallon (FDA 2007). The three most common types of vanilla beans today are Bourbon or Bourbon-Madagascar vanilla beans, Mexican vanilla beans, and Tahitian vanilla beans (Herbst 2001). Bourbon vanilla, or Bourbon-Madagascar vanilla, produced from Vanilla planifolia plants introduced from the Americas, is the term used for vanilla from Indian Ocean islands such as Madagascar, the Comoros, and Réunion, formerly the Île Bourbon. They are the thinnest of the three types of beans and quite rich and sweet (Herbst 2001). 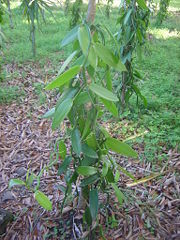 Mexican vanilla, made from the native Vanilla planifolia, is produced in much less quantity and marketed as the vanilla from the land of its origin. It is thick, with a smooth, rich flavor (Herbst 2001). Vanilla sold in tourist markets around Mexico is sometimes not actual vanilla extract, but is mixed with an extract of the tonka bean, which contains coumarin. Tonka bean extract smells and tastes like vanilla, but coumarin has been shown to cause liver damage in lab animals and is banned in the United States by the Food and Drug Administration (FDA 1998). Tahitian vanilla is the name for vanilla from French Polynesia. It is the thickest and darkest of the three types, and intensely aromatic, but not as flavorful (Herbst 2001). The term French vanilla is not a type of vanilla, but is often used to designate preparations that have a strong vanilla aroma, and contain vanilla grains. The name originates from the French style of making ice cream custard base with vanilla pods, cream, and egg yolks. Alternatively, French vanilla is taken to refer to a vanilla-custard flavor. Syrup labeled as French vanilla may include custard, caramel or butterscotch flavors in addition to vanilla. Vanilla powder is produced by grinding the whole, dried bean, while vanilla extract is made by macerating chopped beans in a solution to extract the flavor and then aging the mixture (Herbst 2001). FDA standards require that pure vanilla extract contain 13.35 ounces of vanilla beans per gallon during extraction and 35 percent alcohol (Herbst 2001). Imitation vanilla consists entirely of artificial flavorings. Vanilla flavoring in food may be achieved by adding vanilla extract or by cooking vanilla pods in the liquid preparation. A stronger aroma may be attained if the pods are split in two, exposing more of the pod's surface area to the liquid. In this case, the pods' seeds are mixed into the preparation. Natural vanilla gives a brown or yellow color to preparations, depending on the concentration. Good quality vanilla has a strong aromatic flavor, but food with small amounts of low quality vanilla or artificial vanilla-like flavorings are far more common, since true vanilla is much more expensive. A product labeled "natural vanilla flavor" contains only pure vanilla extract, while one labeled "vanilla flavoring" involves both pure and imitation vanilla (Herbst 2001). Although pure vanilla extract is more expensive, it is generally preferred in terms of flavor intensity and quality, and with less needed, while imitation vanilla is considered to have a harsh quality with a bitter aftertaste (Herbst 2001). A major use of vanilla is in flavoring ice cream. The most common flavor of ice cream is vanilla, and thus, most people consider it to be the "default" flavor. By analogy, the term "vanilla" is sometimes used as a synonym for "plain." In the United States, ice cream labeled "vanilla ice cream" is only to be made with pure vanilla extract and/or vanilla beans; "vanilla-flavored ice cream" can have up to 42 percent artificial flavoring; and "artificial-flavored ice cream" contains only imitation flavoring (Herbst 2001). The food industry uses methyl and ethyl vanillin. Ethyl vanillin is more expensive, but has a stronger scent. In old medicinal literature, vanilla is described as an aphrodisiac and a remedy for fevers. These purported uses have never been scientifically proven, but it has been shown that vanilla does increase levels of catecholamines (including epinephrine, more commonly known as adrenaline). In an in-vitro test, vanilla was able to block quorum sensing in bacteria. This is medically interesting because in many bacteria quorum sensing signals function as a switch for virulence. The microbes only become virulent when the signals indicate that they have the numbers to resist the host immune system response (Choo et al. 2006). ↑ Data on vanilla "production" seems most often to refer to the cured vanilla beans, which are widely exported. Discrepancies in data may arise because some of the production is processed into vanilla extract locally, and some of that extract is retained for local consumption, while the remainder is exported. Further, the pure vanilla extract may be mixed with the artificial vanilla extract, vanillin. Ackerman, J.D. 2003. "Vanilla Miller." Flora of North America 26:507. Retrieved April 11, 2008. Choo, J. H., Y. Rukayadi, and J. K. Hwang. 2006. Inhibition of bacterial quorum sensing by vanilla extract. Lett Appl Microbiol. 42(6): 637-641. Correll, D. 1953. Vanilla: Its botany, history, cultivation and economic importance. Econ Bo 7(4): 291–358. Food and Drug Administration (FDA). 1993. Part 169: Food dressings and flavorings. Subpart A—General provisions. Subpart B—Requirements for specific standardized food dressings and flavorings. Sec. 169.179. Vanilla powder. 21CFR169.179. Center for Devices and Radiological Health. Retrieved April 11, 2008. Food and Drug Administration (FDA). 1998. Import Alert IA2807: Detention without physical examination of coumarinin vanilla products (extracts—flavoring—imitations). January 30, 1998. U.S. Food and Drug Administration Office of Regulatory Affairs. Retrieved April 11, 2008. Food and Drug Administration (FDA). 2007. Part 169: Food dressings and flavorings. Subpart A&mdsh;General provisions. Sec. 169.3 Definitions. 21CFR169.3. Center for Devices and Radiological Health. Retrieved April 11, 2008. Havkin-Frenkel, D., J. C. French, N. M. Graft, F. E. Pak, C. Frenkel, and D. M. Joel. 2004. Interrelation of curing and botany in vanilla (Vanilla planifolia) bean. Acta Hort. 629: 93-102. (L. E. Craker et al., eds., Proc. XXVI IHC—Future for Medicinal and Aromatic Plants). Retrieved April 11, 2008. Hazen, J. 1995. Vanilla. San Francisco: Chronicle Books. ISBN 081180254X. Rainforest Vanilla Conservation Association (RVCA). n.d. Global warming and artificial vanillin. Rainforest Vanilla Conservation Association. Retrieved April 11, 2008. Rasoanaivo, P., et al. 1998. Essential oils of economic value in Madagascar: Present state of knowledge. HerbalGram 43: 31–39, 58–59. This page was last modified on 30 August 2008, at 19:04.